Sun-baked mud bricks line winding alleyways, arches and courtyards in one of the oldest towns on earth, according to Unesco. Yazd is the focal point of Iran’s Zoroastrian culture. Parched exposed brick gives Yazd the feel of some place ancient. Topped by a jungle of ‘badgir’ wind-towers, the result is a baked-brown stepped horizon. This is the spot in which to get lost and feel removed, as high walls shield houses from the mesh of lanes zigzagging the town. Get to the bazaar’s rooftop for views to leave head spinning. 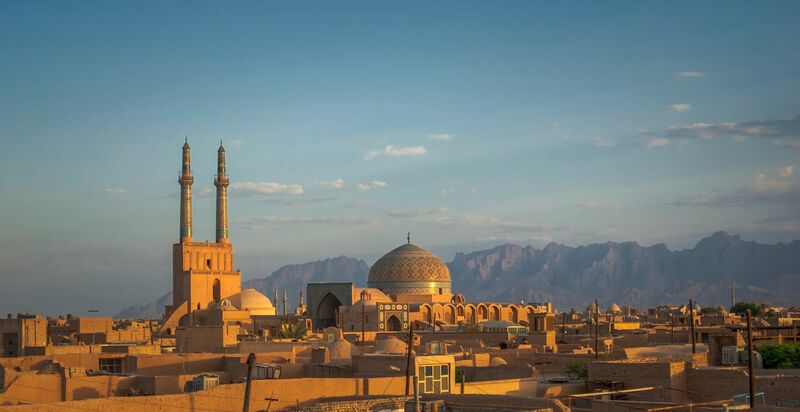 Yazd is the emblem of contrast and antidote to metropolis cities such as Tehran. This lovely old city, filled with mosques and windtowers, is a highlight of central Iran. A haven for backpackers and adventure travelers and it is easy to see why. Plan to spend a few days so you have a chance to soak up the atmosphere and spend ample time lost in the tiny alleys of this historic treasure. The beautiful Jam E Mosque is visible from all over the city and serves as the perfect landmark for lost explorers of Yazd. Yazd is the second historical city of the world and also is the first city around the world which was made by adobe.Those people who are interested in historical places should visit this city.I assure them that they will like it. Amazing culture and history dating back thousands of years...a great mix of old and new. It's my hometown and I like to live there my entire life! یزد از لحاظ تاریخی شهر شناخته شده ایست. به همان اندازه که از لحاظ مردمان مذهبی شناخته شده است. مردمی که واقعا می توان گفت فرهنگ بالایی دارند. در سالهای اخیر این شهر پیشرفت بسیار زیادی داشته است چه از لحاظ شهرسازی و چه از لحاظ امکانات شهری..